Compare Warming Trays: Broil King or Toastess? 1. They allow keeping food warm during the entire duration of a reception or a party. 2. When you are busy preparing a meal that includes a number of dishes, warming trays can keep warm those already cooked while you prepare the others. 3. When you want to impress your guests with the presentation of your gastronomical creations, cordless versions of plate warmers make it possible to bring the food to the table and keep it warm there, instead of serving in the kitchen. 4. When guests are expected for dinner, warming trays allow you to finish all cooking tasks and keep the food warm before guests arrive, so that when they arrive you can attend to them without having to worry about cooking. 5. For people observing the Jewish Sabbath, plate warmers allow keeping the food warm from Friday sundown until the end of Sabbath without having to turn on the stove. This article will compare Broil King NWT-28S and Toastess TWT-40 warming trays. These were not just the most popular among Amazon customers at the time this article was written, but they had also received mostly excellent reviews from most Amazon buyers (an average rating of at least 4 stars each, out of 5 stars!). Selected Warming Trays on Amazon. Toastess TWT-40 does not have a thermostat. Its temperature is automatically controlled. It needs to be plugged until the ready light goes on (about 8 minutes), then unplugged and set in a table or buffet. It maintains the heat for 60 minutes. You can also keep it plugged in for extended warming, in which case it will cycle on and off to maintain a temperature set by the manufacturer. 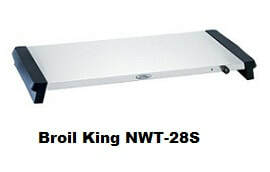 Broil King NWT-28S warming trays are equipped with a thermostat that can be used to control the temperature. Toastess TWT-40 does not have a thermostat and the temperature is automatically brought to the level set by the manufacturer. Note that though the temperature reached is not specified, the unit heats up to a pretty high temperature, and when unplugged, stays "warm" for about 60 minutes. After being plugged in for 8 minutes, Toastess TWT-40 can be unplugged and brought to table. The warm temperature will be kept for 60 minutes. Broil King has a power light, at one end of the warming tray. Toastess TWT-40 has a power light and a ready light that lets you know when the tray has reached the temperature set by the manufacturer and that it can be unplugged. To see the exact prices for these warming plates, please click the product link images in the Amazon products section below. So, which warming tray to get? - Broil King tray is larger. - Broil King tray comes with a 2-year warranty as opposed to the 1-year warranty offered by Toastess. Even though the Broil King unit is more expensive, if you will be using your warming tray often and specially for receptions, a larger size unit with a longer lasting warranty would be preferable. Otherwise, you would be just as happy with the Toastess warmer tray. 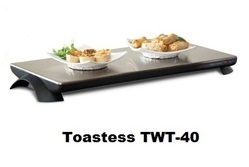 Now, if you need a warming tray that you’ll be able to bring to table for serving while keeping the food warm, then you should pick the Toastess TWT-40. Although it can also be used in a plugged mode on the kitchen counter, the main advantage of this units is that it can be brought to the dinner table or any where else you may want. It takes just 8 minutes to warm up when plugged, and it can stay warm up to 60 minutes when unplugged and cordless. When plugged, there is no danger of overheating as it has automatic temperature control. It is also suitable to be brought to the dinner table as it looks very attractive. Please click the warming tray of your choice below to see the price information or to purchase.